Despite the less than favorable weather patterns lately, specifically referring to a general lack of rainfall and low water conditions, I thought I would present some information that might just spark your interest enough to plan a fall fishin’ trip. Most streams in this part of Pennsylvania are experiencing low water levels, however there are a couple exceptions. 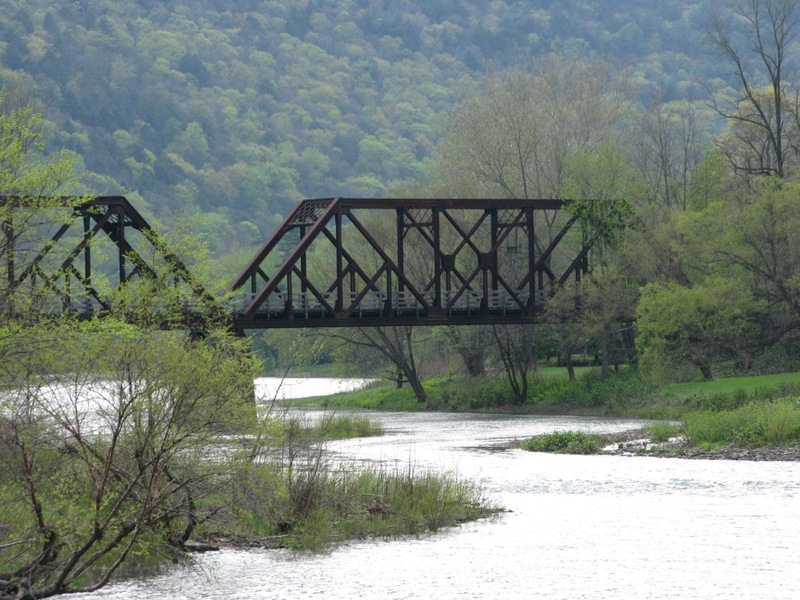 The two locations I want to point out are Big Pine Creek in Lycoming County, and Penn’s Creek. Back over Labor Day weekend, there was some heavy thunderstorm activity in the Tioga County and northwestern Lycoming County regions that sent Big Pine Creek’s flow from a little over 100 cfs to more than 1200 cfs. Since then, Pine has been running well above its median daily statistic from data of 94 years. Today, after a spike to 350cfs on October 8th, Pine is flowing (at the Cedar Run gauge) at 209 cfs. Penn’s Creek at the Penn’s Creek USGS gauge also spiked yesterday to 150 cfs and is presently spot on for its median flow at 89 cfs, with 83 years of data. Water temperatures in both streams are in the mid-fifties. 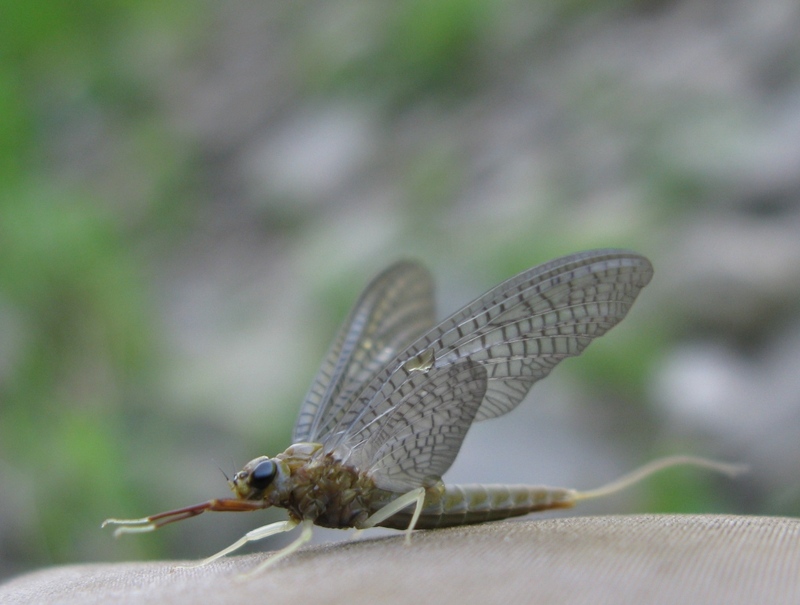 The fishing report for Penn’s Creek has Slate Drakes hatching most days from about ten AM until 2 PM, and there is also activity of October Caddis, Blue-wing Olives, and Crane Flies. 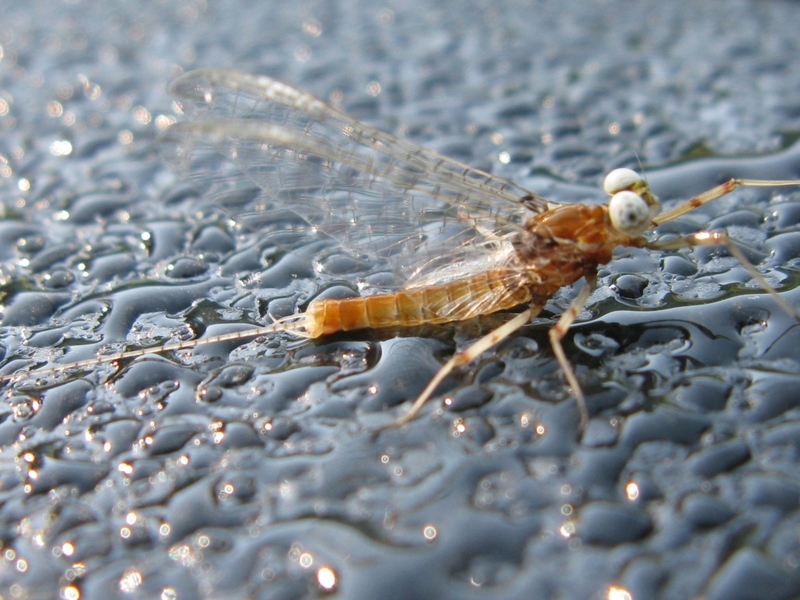 Nymphs of these species would also take fish, along with some attractor drys, terrestrials, and streamers. Following up on my fishing trip (article posted here on October 4th) to Spring Creek on October 3rd, the lower three miles of Spring Creek also has adequate flows to permit fishing, where you’re not having to worry so much about spooking the trout. There are no Slate Drakes on Spring Creek, but there are sporadic hatches of caddis, tricos, fairly regular but spotty, around mid-day, and #18 BWO’s in late afternoon. The flow at Milesburg spiked at 260 cfs on October 7th, and has leveled off at 139 cfs, right on the median flow. There are direct website links to all three fly shops on my links listed on the right. Get out there and wet a line. I’d be going out myself this weekend, but I have plans to work at the cabin with my huntin’ buddies in preparation for deer camp. Tight lines everyone! PS: Oh, I have to add this, the band Flipside, with whom I sat in on drums a couple weeks ago on Mustang Sally; they are playing this Sunday from 5 – 8 PM at the Trout Run Hotel. It’s an odd time, but in between “games.” I saw the keyboard player / guitarist / band leader at another bar this past Monday. We enjoyed the cheese steak special and a few beers at The Crippled Bear. We already worked it out for me to sit in again on Sunday. Ride, Sally, Ride! I’d have someone video it, but my camera is broken and I have not yet replaced it. 06-05-12: Pine is in great condition for this time of year. It has cleared over the past two days to an olive and the temperature remains in the upper 50’s. We still have Slate Drakes, BWO’s, Sulphurs, and some Brown Caddis. 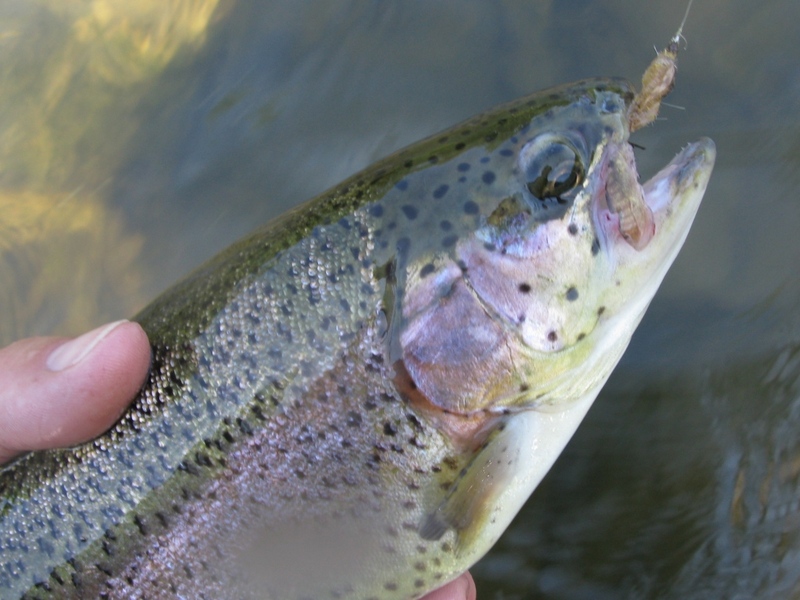 Trout are still active on the surface, and providing very good, but challenging fly fishing to some fine trout. The long range weather forecast calls for showers, and cool temperatures for the next week, so you should be fishing! If you visit the Pine Creek Valley, be sure to stop in for a great deli sandwich on home-made bread at The Slate Run Tackle Shop / Wolfe’s Store. The last time I was fishing on Big Pine Creek was Sunday May 20th. A tough day fishing-wise. A beautiful day otherwise. I had the best day of my life there on May 17th. That’s another blog post. But on this day, I was expecting to do very well. Wrong. Spent Brown Drake Spinners were on the water, more prevalent than the other 13 different bugs flying about, and I didn’t have any. I had generously given away my last few Slate Drake Spinners to my friends that I’d been fishing with on the previous Thursday trip. They were fishing Friday and Saturday while I was going to the cabin to cut firewood. So I didn’t need any Slate Drake Spinners. Or so I thought. A Slate Drake Spinner might have risen a few trout that were eating those big Brown’s, because being an extended-body size eight, they were a little smaller than the Brown Drakes, but they might have done the trick. But I just about threw my arm off, casting, changing flies, casting, changing flies, casting. My favorite section of PA Rt. 414. 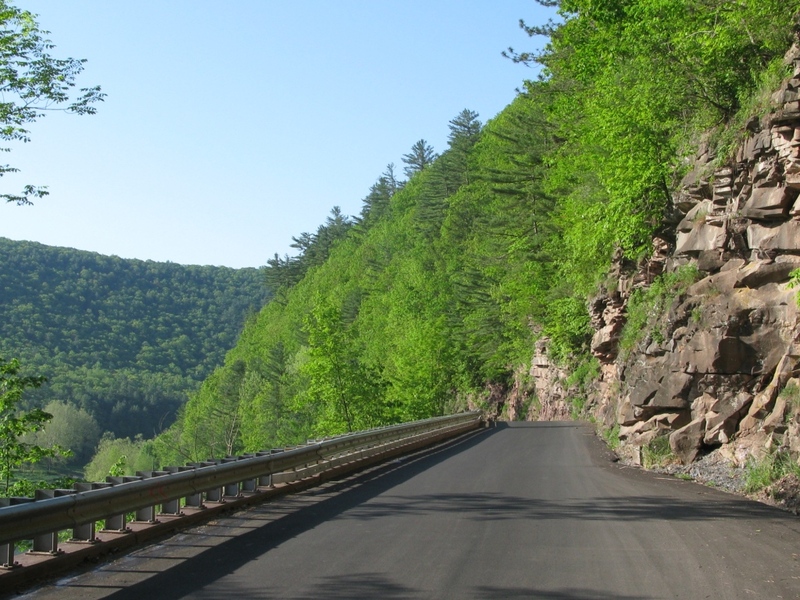 That’s right – this is a state highway, and even though this section was replaced in the summer of 2011, parts of it are still too narrow for two cars to pass at the same time. Nice! It’s not the interstate. And that’s another good thing. Off to the left you can see the creek, and the drop-off. This is the drop-off. About 400 feet. You don’t want your car to go over the edge here; there isn’t much to stop it until you land on the old railroad now walking-hiking-biking trail near the bottom. Part of the trail is visible to the left of center right of the creek. That’s why the State Road Crews can’t make this a two-lane road. It’s practically built into the side of a cliff. A spectacular view of the creek, and the valley both ways, upstream and down. Manor Hotel across Big Pine Creek from the rear of the Slate Run Tackle Shop. Note the large log pile. And the smoker behind the building. The small green structure with the black roof. Yup. That’s right. Bar-b-Que! They smoke their own. Good place to eat and drink. The original Manor Hotel burned to the ground in a spectacular fire in May of 2004. The stream Slate Run is right behind the Hotel and the log pile. Pine Creek Valley at Slate Run, behind the Fly Shop, looking upstream. I just happened to catch the turkey vulture just above the crest of the ridge. March Brown dun. Cool night and heavy dew. Who ever owned this truck had parked it there overnight, which was convenient for these photos. This fellow and the spinner in the next photos were my only companions as I suited up and rigged my rod. March Brown / Gray Fox Spinner. There was also a Brown Drake Spinner there too, but I made the mistake of trying to reposition it for a better photo, and it flew off. Nice Pine Creek rainbow, close to 17″ that fell to a 3x long #8 Ephemera nymph, swung just under the surface. This pattern could pass for either a Green or Brown Drake. This solitary fish was the result of 2-1/2 hours fruitless casting to rising trout feeding on Brown Drake Spinners. As noted above, I didn’t have any. But I gave it the old college try and threw enough different patterns to open a fly shop with. See where the fish splashed a drop of water on my lens. 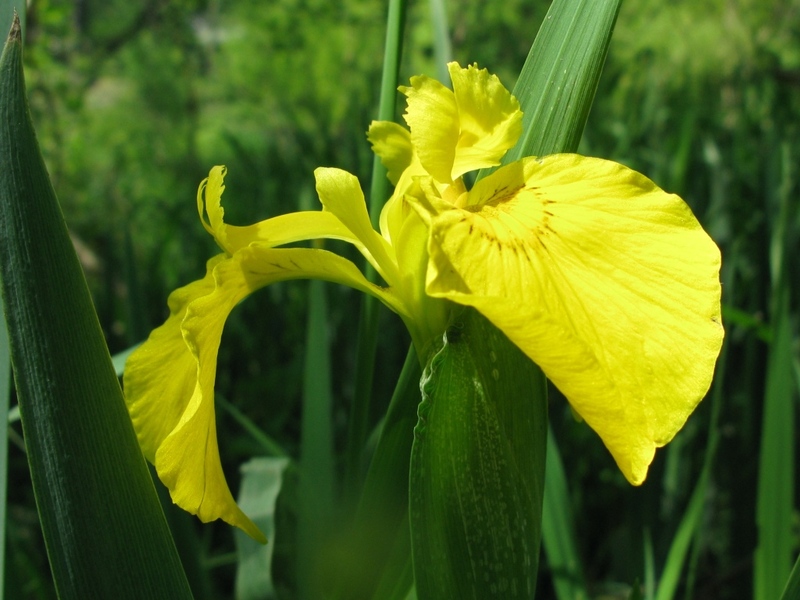 On the way back to the car, I came upon this wild iris in bloom. In the afternoon, I went to the lower end of the Delayed Harvest Section, first, to have lunch at the picnic tables. I had homemade potato salad, a turkey sandwich, and some corn ships. Oh, and an ice-cold Yuengling. Secondly, I wanted to nymph fish the riffles at the head of the long pool. I hooked a few fish there using a two-fly nymph rig, but didn’t land any. 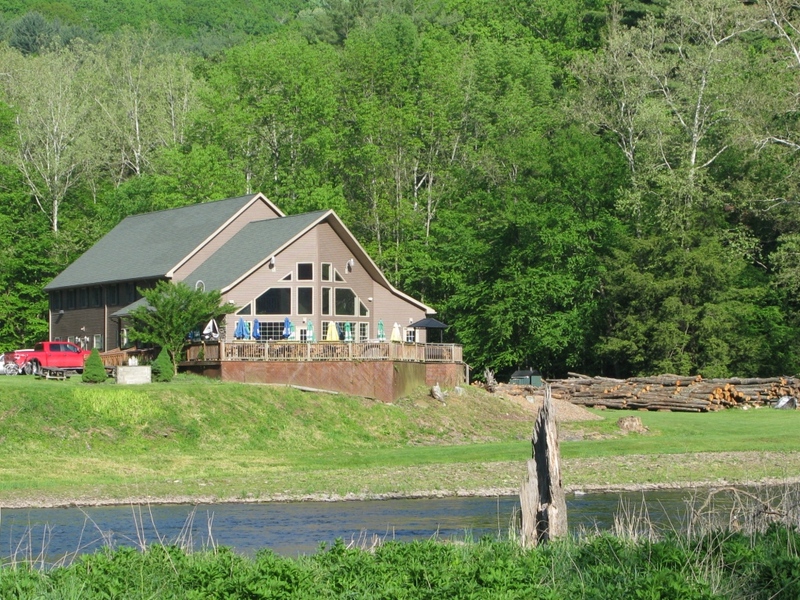 After fishing I sat at the tables having another beer and an agent from DCNR, Department of Conservation and Natural Resources – Forestry Department, drove in and stopped. He got out of his vehicle and came over to chat. I found it interesting that a forester was carrying a sidearm. He was actually a warden, but not for the Fish Commission, or Game Commission. In Pennsylvania, we have two separate departments for that. We are the only state in the Union to maintain two separate Fish and Game Agencies. The annual toad mating was in full swing. Hundreds of toads, along the waters edge, in the water, and even floating downstream, some clinging together in the embrace of their instinct, bobbing along in oblivious delight. I could have gotten fifteen toads together in one shot, You had to be careful not to step on them, there were so many. Their mating calls were incessant. 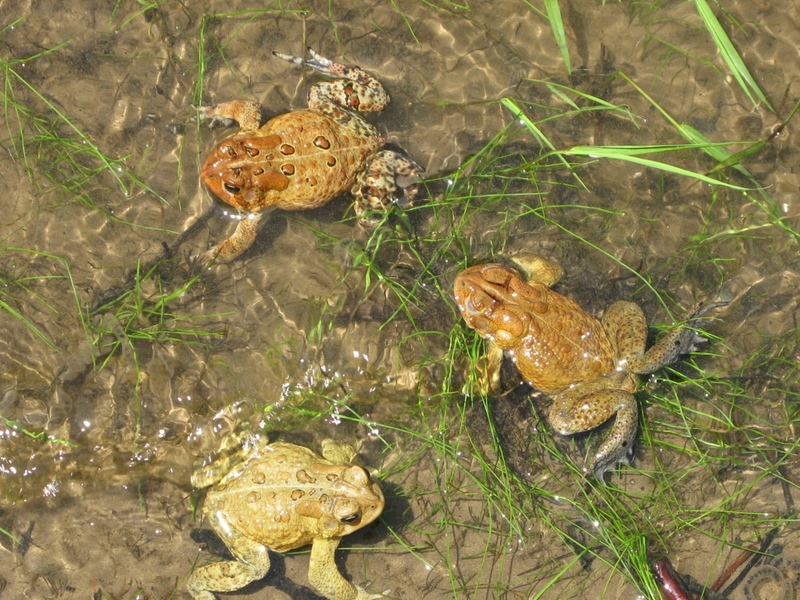 The mating of the toads. I did see one female with five males, all clinging to her. While perhaps only one was actually giving her the business, I guess. I was going to take a photo of that but it was actually kind of revolting. Late afternoon light on the Delayed Harvest Section below the bridge at Slate Run. I did very well here on the 17th, but this particular evening there was no major hatch activity. Before I got into position to take this photograph, I spent an hour and a half parked in the shade at the Hotel Manor taking a nap. When I started fishing I was casting an extended body Slate Drake Thorax Dun Pattern. I hooked one large trout and lost him. I rose a few more and missed them. Or they missed me. Slate Drake Dun. This is a heavy hatch on Big Pine Creek. One that lasts, too. These flies will also hatch mid-stream. They do not all migrate to the shallows and edges to emerge. Note the lighter colored forelegs; this is why one Slate Drake pattern is called the White-Gloved Howdy, as if it’s extending for a handshake. A friend who knew I was going to be fishing the area came by to join me. That wasn’t definite, especially with this particular friend, because you never know what he’ll get in to. I was kind of thinking of leaving before he arrived, but when a friend comes to fish with you, I did the right thing and stayed longer. He fished soft-hackles, I continued to cast my Slate Drake pattern, but neither of us rose a fish. I finally gave in to desperation, took off the dry tied on a a #8 black beadhead Wooly Bugger and hooked this 18″ brown in less than five minutes. 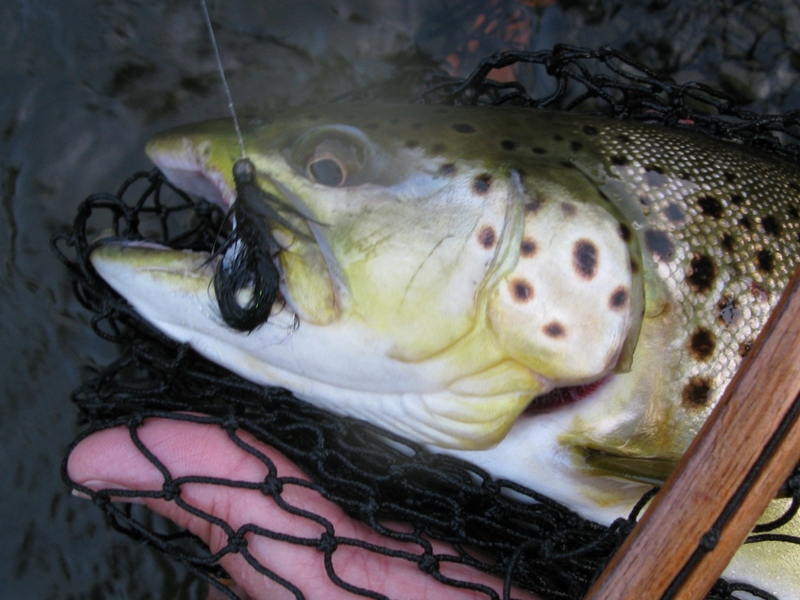 18″ brown trout and #8 black bead-head Wooly Bugger. Sometimes desperation is a good thing. Not too long after I released this fish, maybe twenty minutes, I called it a night. My precious, mallard wing-eating puppy dog, Abigail, had been at the cabin all day and I figured I’d better start back before darkness set in so I could let her out. I had a brisk quarter-mile walk to my car, put the rod in the car, took off my vest and waders, and hopped in the car. I had the wonderful drive through that beautiful valley ahead of me. Sunday evening. Fifteen miles to Morris. Leaving Slate Run, past Cedar Run, through Blackwell. Fifteen miles of driving without passing a solitary vehicle in either direction. That’s solitude for you. And by the way, no cell service either. 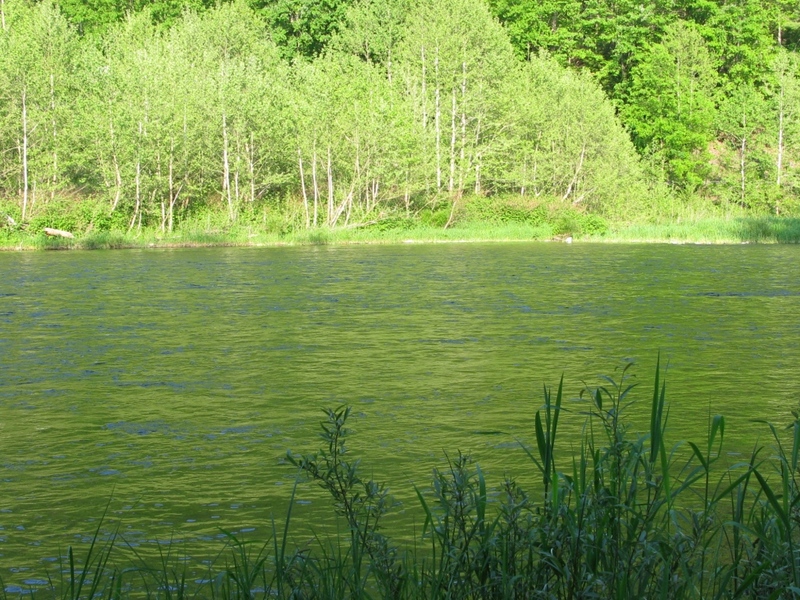 I can’t wait to get back over there since the stream conditions and fishing are so — perfect. On Monday morning, I sat at my vise and developed a perfect, two-tone, yellow on bottom, brown on top, foam extended body, three tails for a Brown Drake Spinner. So far, it’s just a body, a prototype. ready for a size #12 Tiemco 2488 hook. I need to finish a few flies. It will be suitable for duns and spinners both. But one thing is sure; with this new Brown Drake weapon, the trout will never do that to me again. Some parts of central and south-central Pennsylvania got a lot of rain from Sunday evening, May 13th through yesterday, May 15th. However the north central and western north-central part of the state did not get as much rain, since this recent rain was mostly a southwest to north east moving system. For anyone who thought of making a weekend fishing trip to the Little Juniata or Penn’s Creek, those streams are going to be running pretty high, as in get your kayak and life vests out and leave the rods at home. Penn’s Creek spiked yesterday at almost 3000 cfs, and is currently running at 2000 cfs. No fishin’ there boys and girls. Maybe in a week, considering the mean flow on Penn’s Creek for May 16th is 619 cfs. The Green Drakes had started last week on Penn’s Creek at Glen Iron, but now all bets are off. Except Big Pine Creek. 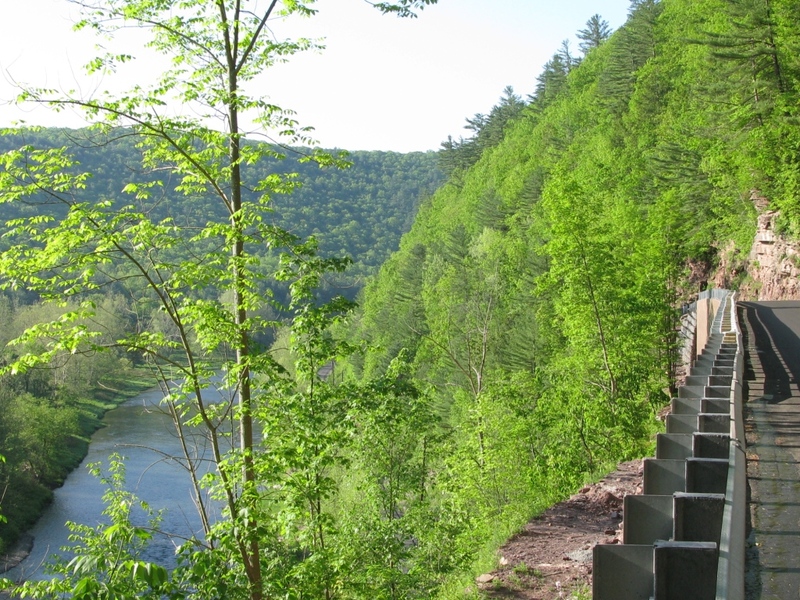 The Green Drakes are starting there, and there’s over 50 miles of water from Waterville to Ansonia in some of the most beautiful scenery in the entire state of Pennsylvania. 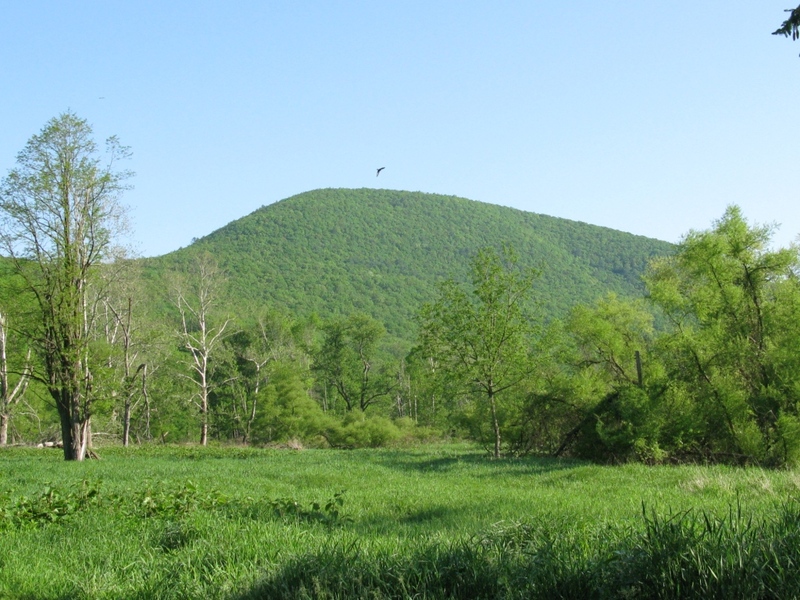 That is in comparison to the ten miles that usually hosts the hundreds of anglers for the Drake Hatch on Penn’s Creek, where it can get so crowded you need a shoe horn to squeeze yourself into a fishing spot. 05-15-2012: Pine is in great shape at this time. We missed most of the rain that went through in this last couple of days. They are still predicting some thunder storms tomorrow. If we survive them, we are on our way to a great weekend of flies and fish. The size #14 olive has started to hatch, along with Gray Foxes, Sulphurs, Slate Drakes and a few Green Drakes. This next week will probably provide fishing to most of the Drakes. Luckily we only received .65 of and inch of rain in the last 11/2 days. Clarity is good. Level is above average, but very fishable. 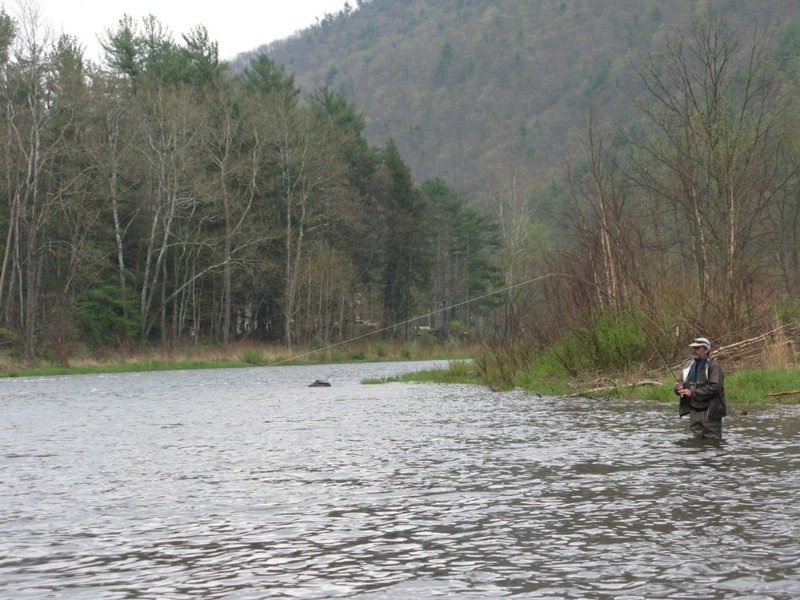 Kettle Creek, Sinnemahoning, Young Woman’s Creek, Slate Run, Cedar Run, Little Pine Creek – there is fishing NOW and there will be (most likely) good fishing through this weekend, since the weather will be clear for the next several days. I’m fishing tomorrow…but then I have to work the weekend cutting firewood at the cabin, but looks like Sunday may be an all-day sucker for me as far as fishing goes…I’m now planning to be on Big Pine Creek…anyone care to join me? An angler plays a trout in the Delayed Harvest Section of Big Pine Creek near Slate Run, Pennsylvania. 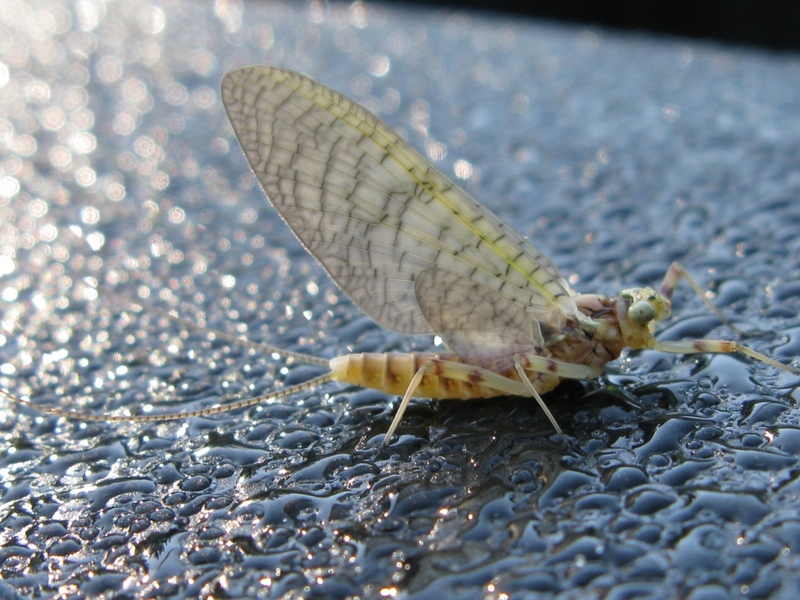 The March Brown hatch on Pine Creek this year was the best since the 1970’s. Exceptional dry fly fishing on Big Pine Creek this season. Photo taken April 26th – Don Bastian. Big Pine Creek, below the village of Waterville. The gloom of late afternoon on Big Pine Creek. Don Bastian photo, April 26. 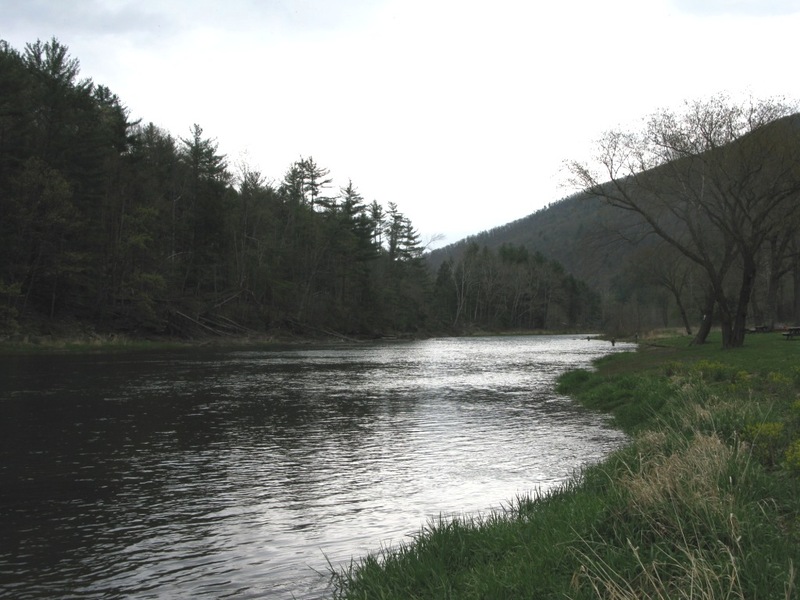 This is a big beautiful valley, and when conditions are right, can provide great fishing. Conditions are currently right.